The late 1970s and 1980s witnessed the emergence of a younger generation of artists working in the UK who began to receive international attention for practices which, although incredibly diverse, shared a revived interest in the sculpted object, in materials, and in ideas around making. Making It is the first exhibition to survey this exciting moment in British sculpture. It shows how approaches to object making were reinvigorated by the breakthroughs in conceptual and performance art made by preceding generations and by sculptural and cultural inspirations from beyond these shores. 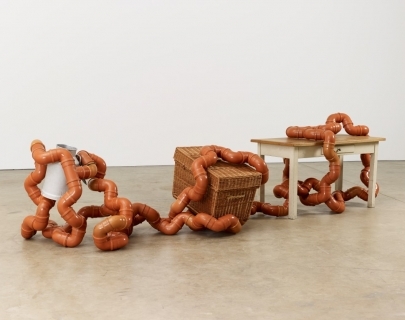 Drawn primarily from the holdings of the Arts Council Collection and augmented with major loans from important UK public and private collections, Making It represents the work of over 40 artists including Tony Cragg, Richard Deacon, Antony Gormley, Anish Kapoor, Cornelia Parker and Alison Wilding. This substantial exhibition embraces a wide range of sculptural practices, highlighting shared concerns, as well as important differences, between and within established groups. The exhibition has been curated by Natalie Rudd, Senior Curator at the Arts Council Collection, with Dr Jon Wood, Research Curator at the Henry Moore Institute in Leeds. The Arts Council Collection is grateful to the Henry Moore Institute for their research support and for making available the rich resources of the Henry Moore Institute Research Library.